The notion that Hamas would ever dismantle its security apparatus and deliver the Gaza Strip to Mahmoud Abbas's forces is a fantasy. 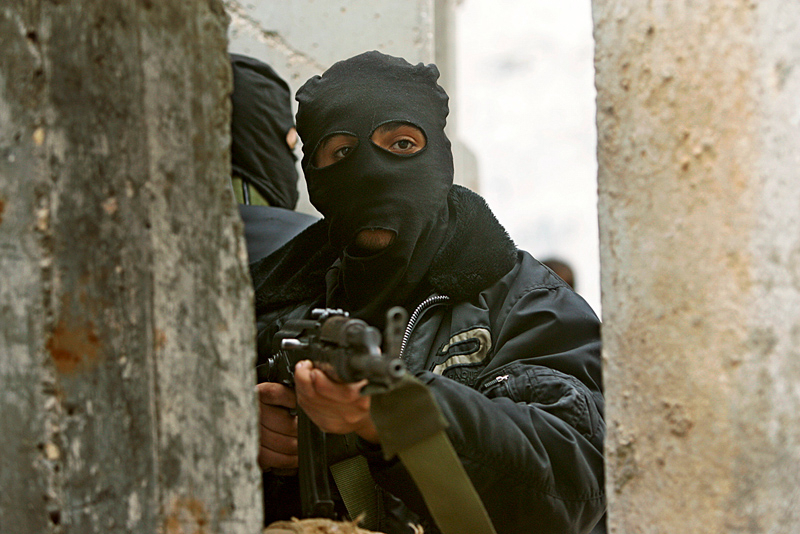 It is estimated that there are about 50 different militias operating in the Gaza Strip. These militias are said to be in possession of about a million pieces of weaponry. If Hamas refuses to disarm, that is one thing, but when Abbas's supposed loyalists also come out with similar statements, that this is akin to spitting in the face of the Palestinian Authority president. Palestinian Authority (PA) President Mahmoud Abbas says he does not want to see "militias" in the Gaza Strip if and when the "reconciliation" agreement he reached with Hamas is implemented. "The Palestinian leadership will not accept the model of militias in the Gaza Strip because it isn't a successful one," Abbas told the Chinese news agency Xinhua. "There should be one authority, one law and one weapon, with no militias." Hamas, for its part, has already rejected Abbas's demand. Hamas has said it has no intention of disarming despite the "reconciliation" agreement recently signed in Cairo. "We can't give up our weapons and because the Palestinian people are still in the phase of national liberation," said Yehya Sinwar, the Hamas leader in the Gaza Strip. "We also can't and won't recognize Israel." Hamas's refusal to disarm should come as no surprise. Since Hamas violently seized control of the Gaza Strip ten years ago, it has built a huge security apparatus that consists of thousands of militiamen, most of them members of Ezaddin Al-Qassam, the movement's military wing. Hamas has also smuggled large amounts of weapons into the Gaza Strip and dug dozens of tunnels along the borders with Israel and Egypt. The notion that Hamas would ever dismantle its security apparatus and deliver the Gaza Strip to Mahmoud Abbas's forces is a fantasy. Hamas has no problem allowing Abbas loyalists to return to the Rafah border crossing with Egypt, as was the situation before 2007, when Hamas seized control of the Gaza Strip. But this is the most Hamas would be willing to sacrifice to support the success of the "reconciliation" accord with Abbas and his Fatah faction. This is a price Hamas is prepared to pay, not out of affection for Abbas but because it serves its own interest. The reopening of the Rafah terminal will allow Hamas to breath after years of isolation and blockade. A few hundred Abbas loyalists who manage the Rafah border crossing do not pose a threat to Hamas's rule over the Gaza Strip. Above all, Hamas seeks to prevent a return to the pre-2007 era, when the Palestinian Authority had exclusive control over the Gaza Strip. Until that year, the PA had multiple security forces that maintained a tight grip on the Gaza Strip and employed an "iron fist" policy against Hamas and other opposition groups. The statements of Hamas leaders in the past few days show that they are seeking to duplicate the model Hezbollah uses in Lebanon. Hamas wants to remain in charge of security matters in the Gaza Strip while restricting the Palestinian Authority's responsibilities to civilian affairs. Hamas's refusal to disarm and hand over security responsibilities to Abbas could torpedo the Egyptian-sponsored "reconciliation" agreement -- especially in light of the PA's rejection of copying the Hezbollah model in the Gaza Strip. While Abbas is talking about the need for Hamas to disarm and dismantle its militia, however, some Palestinians are wondering what would be the fate of armed groups in the Gaza Strip that are affiliated with Fatah if the "reconciliation" agreement is implemented. Hamas is far from the only party with a militia in the Gaza Strip. Almost all of the other Palestinian factions, including Islamic Jihad, Popular Front for the Liberation of Palestine (PFLP) and Democratic Front for the Liberation of Palestine (DFLP), have their own militias there -- in addition to a number of ISIS-inspired militias that have also appeared in the Gaza Strip in the past few years. Abbas's real test will be the day he is forced to face the unruly Fatah-affiliated armed groups in the Gaza Strip. Abbas has good reason to be worried about the Hamas, Islamic Jihad, PFLP and DFLP militias. None of these groups will ever voluntarily lay down its weapons or dismantle its militias just because the Egyptians or Abbas want it to. Abbas, moreover, also needs to worry about the Fatah-affiliated groups: they also are unlikely to comply with his wish to see no militias in the Gaza Strip. Fatah has in the Gaza Strip several armed groups not known for their blind loyalty to Abbas. Some of these disgruntled armed groups, in fact, often sound more like Hamas and Islamic Jihad than Fatah. Fatah has quite a number of militias in the Gaza Strip: Aqsa Martyrs Brigades, Ahmed Abu Rish Brigades, Abdel Qader Al-Husseini Brigades, Martyr Ayman Judeh Groups and Nidal Al-Amoudi Brigades. Although they are affiliated with Abbas's Fatah, these armed groups continue to talk about an "armed struggle" against Israel and their desire to "liberate Palestine, from the [Mediterranean] sea to the [Jordan] river." The unruly Fatah-affiliated groups have a history of angering and embarrassing Abbas and the Fatah leadership in the West Bank. The groups often issue statements applauding terror attacks against Israel, such as the recent shooting at Har Adar, near Jerusalem, in which three Israelis were murdered. For the past few years, the Fatah leadership in the West Bank has sought to distance itself from the actions and rhetoric of those Fatah armed groups in the Gaza Strip. That effort reflects the desire of the Fatah leadership in the West Bank to present itself to the international community (and Israel) as a "moderate" party that opposes violence and seeks a peaceful solution with Israel. Even more worrying for Abbas is that in addition to Hamas, the Fatah armed groups in the Gaza Strip are refusing to disarm as a result of the "reconciliation" agreement. Now, not only does Abbas have to worry about Hamas and Islamic Jihad; he has his own Fatah gunmen saying that they too will not disarm. This headache for Abbas poses yet another obstacle to the implementation of the "reconciliation" agreement. As Abu Mohammed, a spokesman for the Aqsa Martyrs Brigades in the Gaza Strip, said recently: "We won't give up our weapons until all Palestine has been liberated." His statement echoes the position of Hamas and all the other armed groups. If Hamas refuses to disarm, that is one thing, but when Abbas's supposed loyalists also come out with similar statements, that is akin to spitting in the face of the Palestinian Authority president. The "reconciliation" agreement has yet to be implemented on the ground, yet the issue of the militias in the Gaza Strip is already emerging as a major obstacle and a severe blow to Abbas. He will now have to decide: either to proceed with the "reconciliation" agreement and accept playing the role of president of a Gaza Strip filled with armed groups and militias -- most of which are no friend of his, or to backtrack and realize that his wish to have one law, one police force and one authority in the Gaza Strip is nothing more than a pipe-dream. I get so annoyed by the continual use of Palestine as though it's a country when it is not. It doesn't even exist in reality. There has never been a country of Palestine or a people of that name. It was once an autonomous entity ruled alternately by Rome, Islamic and Christian crusaders, the Ottoman Empire and the British. But Jewish historical association with the land of Israel can be traced over thousands of years. Some questions are: was Palestine ever recognized as an entity by another country? If so what was its language? What was its religion? What was its currency? What caused its demise? Today's 'Palestinians' are just Arabs. Israel must continue its non-stop vigil. Its enemies want Israel to relax, become comfortable and not anticipate attacks, and thus far Israel stands its watch without fail. It must continue this. Situated in a virtual "sea of Arabs" surrounding it, it cannot do less, until the real miracle of Holy Land peace actually takes place. Perhaps a movement of our tribe postulating that these Arab squatters are on our land and we want them off by negotiation or by force? "There should be one authority, one law and one weapon, with no militias." This sounds more like a gang sit-down discussing "peace" among themselves than serious future political leaders aspiring to run real governments. "This sounds more like a gang sit-down discussing 'peace' among themselves than serious future political leaders aspiring to run real governments." That's because it's exactly what it is. Reading of the "reconciliation", I'm reminded of nothing more than the scene in Mario Puzo's "The Godfather", where Don Corleone tried to convince the heads of the other four Mafia families that peace between them is in all their interests. The only real difference is that Don Corleone managed to convince all of them because all of them were motivated by greed, and war between them was counter-productive for profits. For Fatah and Hamas, monetary profit is secondary, murdering Israelis is their primary purpose, and if they happen to murder a few of each other, they don't care. This reconciliation won't last any longer than any of the previous attempts. The PA and Hamas are motivated by two completely different philosophies. The PA is non-religious and nationalist; Hamas is deeply religious and jihadi. You only have to read their respective constitutions to see how true this is. WHY do their constitutions throw up so much difference? Because "Palestinians" are actually populated by two separate ethnic groups. The Palestinians of the West Bank are Isra-Cana'anite in origin; the population of Gaza come principally from Egypt and the Gulf. They dislike each other intensely - more, truth to be told, than they dislike Israel. The only surprise is how socialist leaning millennials and old school Marxists continue to hold Hamas in high regard along with the terrorist group the Muslim Brotherhood most recently accused of murdering 35 Egyptian policemen. That the US legislature has delayed enacting a Bill declaring the MB a terrorist group and President Obama's suspicious support of the MB at first deflecting consideration of Morsi as a Muslim Brotherhood member and after the coup insisting they be given a voice in the Egyptian political system is indicative of how foolish people are in regarding the Arab Spring as a some sort of liberal revolution. Such inane characterizations of terrorist groups contribute to an ideology of false positives, in which Hamas and their parent organization the MB come looking like "revolutionaries" instead of the hard corps admirers of the Hitlers and Stalin's and Hussein's in the world and is the grist for extremist Islamists. Abbas will now have to decide: either to proceed with the "reconciliation" agreement and accept playing the role of president of a Gaza Strip or to backtrack and realize that his wish to have one law, one police force and one authority in the Gaza Strip is nothing more than a pipe-dream. Will he succeed in being honest to confirm that the war would end? Abbas? Would he? A "Pipe Dream" is what it is and what it has been. In the interim, Abbas saw how wealthy Arafat made his wife stationed near a French bank, and I suggest Abbas has a similar plan, but either he started late or is even crazier for money that Arafat was. I say he should keep pipe-smoking until his home is an "Iron Lung." His true intentions have been very evident over the years. He shall earn the demise in store for him in his future. Any honesty on his part is a mirage. .....both are but Poisonous Snakes!